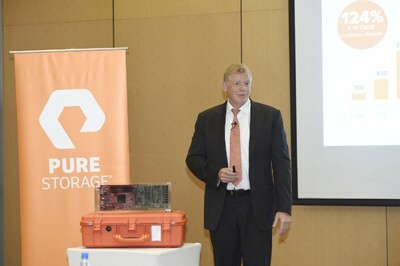 On July 25, Pure Storage (NYSE: PSTG), the market’s leading independent all-flash data platform vendor for the cloud era, unveiled its vision of the data platform for the cloud era at the Pure Live event in Hanoi, to help organizations accelerate innovation and business transformation. Data is the lifeblood of the digital generation. Current estimates are that approximately 50 zettabytes (ZB) of data will be created in 2020 alone (up from just four in 2016), and 180 ZB five years later in 2025 - an unprecedented growth rate. As data creation pivots from humans to machines - driven by sensors, IoT, digital cameras and myriad connected devices - it has exploded in volume. Simultaneously, the ability to analyze this data has transcended human cognition, with traditional analytics giving way to artificial intelligence (AI), machine and deep learning, neural networks and real-time data stream analytics. These new, data-driven applications require a different approach to storage, designed to deliver massively-parallel access to data at a very high bandwidth. Evolution, a global research conducted by Pure Storage, confirms that a new digital era has arrived in Vietnam. The survey found that digital transformation is reaching a tipping point across Vietnam, with 53% of businesses now deriving more than half their revenue from digital streams, mainly to win over new customers and generate cost savings (57%), and stay competitive (51%). However 48% of businesses cited technical complexity as the biggest barrier to digital transformation. “It is clear that digital transformation is no longer a buzzword. Modern digital businesses require a data platform that eradicates all complexity while enabling businesses to build a new class of applications, to extract new insights from data and to do so in real-time,” said Scott Dietzen, CEO, Pure Storage, who delivered the keynote at Pure Live. At the Pure Live event, Pure Storage discussed emerging technologies such as AI, IoT, and machine learning, how they continue to change the way businesses operate, and what it takes to thrive in a digital economy. To help organizations in Vietnam truly put their data to work, Pure Storage has announced its new data platform that includes more than 25 new software features, as well as comprehensive hardware updates. These are set to deliver the speed, agility, and intelligence that businesses in Vietnam need to stay competitive and scale.